Sugar Gliders usually nest deep in hollows of trees and are sound asleep during the day. Such animals can be difficult to find and remove while up in a tree. A technique that is used is to plug the opening of the hollow prior to felling the tree. This ensures that animals don't flee and expose themselves to danger or cause parents to be separated from their young. The section of the trunk or limb containing the hollow is carefully cut to provide safe access and allow removal of the nesting animals. 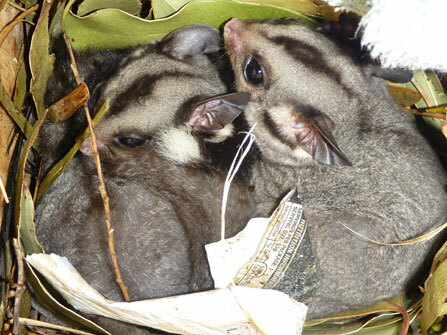 This family of Sugar Gliders lived in a tree that had to be removed during the construction of a new road. They were captured in this way and then settled into a nest box and relocated into a suitable tree outside of the construction zone.